Mine shipped today. With me tomorrow! That's awesome, Chris! Where did you get your OM-D? 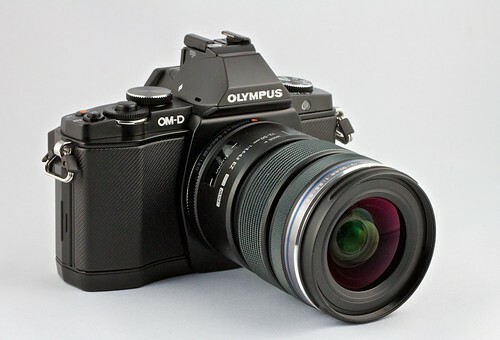 As a the owner of a beloved OM-2, I want an OM-D. I wish I could justify it. It looks beautiful! Hey! You forgot the links to the fluorescent lights and the macro rail! Thanks for the review Derrick - now if I could only get one! Would be interested in what other lenses you would recommend beyond the 12-50. Right now I'm thinking the Panasonic 20 1.7 for indoors/low light, and the 45 1.8 for portraits. The Panasonic 20mm f/1.7 and Olympus 45mm f/1.8 are both fabulous lenses. The Oly 12mm f/2.0 is probably better than the Panny 20mm but it's a lot more expensive. I've also got the Samgyang 7.5mm fisheye and Panasonic 100-300mm and enjoy using both of them. Hi Ken, I agree with Chris about the Panasonic 20mm and Oly 45mm. I *love* the 45mm f/1.8. I tested the Sigma 30mm f/2.8 that runs $199, and I thought it is a good way to add prime glass to your collection without spending too much. Speaking of that, I would like to have the Oly 12mm f/2, but it's too expensive ($799) for my micro four thirds budget right now. Ken: before you buy the Panasonic 20mm, I'd take a look at the Panasonic 25mm. I really like my 20mm: it's quite sharp, very compact, pretty affordable, and produces nice colors and contrast. It focuses slowly compared to just about every other lens for the system (especially on Olympus bodies), however, and the bokeh is kind of harsh. The 25mm, on the other hand, produces better colors, really nice contrast, and smoother bokeh. But, it's bigger and quite a bit more expensive. Probably most dispositive, though, is what kind of normal lens do you want: a wider one or a narrower one. The 20mm offers a 57 degree angle of view, equivalent to 40mm on a full frame camera. The Panasonic 25mm provides a 47 degree view, the same view as a 50mm on a full frame sensor. Those 10 degrees - roughly 20% - makes a big difference. I personally see the world closer to that 50mm field of view than the 40mm field of view. Derrick, can you share links to Adorama or other sites on the items you describe for macro stuff at end of the podcast?